Gaia is a space observatory of the European Space Agency (ESA), launched in 2013 and expected to operate until c. 2022. The spacecraft is designed for astrometry: measuring the positions, distances and motions of stars with unprecedented precision. 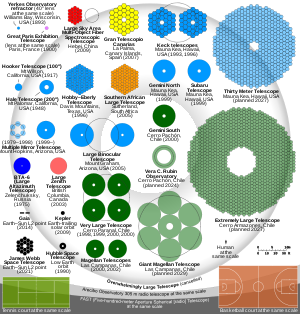 The mission aims to construct by far the largest and most precise 3D space catalog ever made, totalling approximately 1 billion astronomical objects, mainly stars, but also planets, comets, asteroids and quasars among others. The spacecraft has monitored each of its target objects about 70 times over the first five years of the mission to study the precise position and motion of each target, and will keep doing so. The spacecraft has enough micro-propulsion fuel to operate until about November 2024. As its detectors are not degrading as fast as initially expected, the mission could therefore be extended. The Gaia targets represent approximately 1% of the Milky Way population with all stars brighter than magnitude 20 in a broad photometric band that covers most of the visual range. Additionally, Gaia is expected to detect thousands to tens of thousands of Jupiter-sized exoplanets beyond the Solar System, 500,000 quasars outside our galaxy and tens of thousands of new asteroids and comets within the Solar System. Gaia will create a precise three-dimensional map of astronomical objects throughout the Milky Way and map their motions, which encode the origin and subsequent evolution of the Milky Way. The spectrophotometric measurements will provide the detailed physical properties of all stars observed, characterizing their luminosity, effective temperature, gravity and elemental composition. This massive stellar census will provide the basic observational data to analyze a wide range of important questions related to the origin, structure, and evolutionary history of our galaxy. The successor to the Hipparcos mission (operational 1989–93), Gaia is part of ESA's Horizon 2000+ long-term scientific program. Gaia was launched on 19 December 2013 by Arianespace using a Soyuz ST-B/Fregat-MT rocket flying from Kourou in French Guiana. The spacecraft currently operates in a Lissajous orbit around the Sun–Earth L2 Lagrangian point. The Gaia space telescope has its roots in ESA's Hipparcos mission (1989–1993). Its mission was proposed in October 1993 by Lennart Lindegren (Lund University, Sweden) and Michael Perryman (ESA) in response to a call for proposals for ESA's Horizon Plus long-term scientific programme. It was adopted by ESA's Science Programme Committee as cornerstone mission number 6 on 13 October 2000, and the B2 phase of the project was authorised on 9 February 2006, with EADS Astrium taking responsibility for the hardware. The name "Gaia" was originally derived as an acronym for Global Astrometric Interferometer for Astrophysics. This reflected the optical technique of interferometry that was originally planned for use on the spacecraft. While the working method evolved during studies and the acronym is no longer applicable, the name Gaia remained to provide continuity with the project. The total cost of the mission is around €740 million (~ $1 billion), including the manufacture, launch and ground operations. Gaia was completed two years behind schedule and 16% above its initial budget, mostly due to the difficulties encountered in polishing Gaia's ten mirrors and assembling and testing the focal plane camera system. To determine the intrinsic luminosity of a star requires knowledge of its distance. One of the few ways to achieve this without physical assumptions is through the star's parallax. Ground-based observations would not measure such parallaxes with sufficient precision due to the effects of the atmosphere and instrumental biases. For instance, Cepheid variables are used as standard candles to measure distances to galaxies, but the accuracy in their own distance measurement is poor. Thus, quantities depending on them, such as the speed of expansion of the universe, remain inaccurate. Measuring their distances accurately has a great impact on the understanding of the other galaxies and thus the whole cosmos (see cosmic distance ladder). Observations of the faintest objects will provide a more complete view of the stellar luminosity function. Gaia will observe 1 billion stars and other bodies, representing 1% of such bodies in the Milky Way galaxy. All objects up to a certain magnitude must be measured in order to have unbiased samples. To permit a better understanding of the more rapid stages of stellar evolution (such as the classification, frequency, correlations and directly observed attributes of rare fundamental changes and of cyclical changes). This has to be achieved by detailed examination and re-examination of a great number of objects over a long period of operation. Observing a large number of objects in the galaxy is also important to understand the dynamics of our galaxy. Measuring the astrometric and kinematic properties of a star is necessary in order to understand the various stellar populations, especially the most distant. Determine the position, parallax, and annual proper motion of 1 billion stars with an accuracy of about 20 microarcseconds (µas) at 15 mag, and 200 µas at 20 mag. Determine the positions of stars at a magnitude of V = 10 down to a precision of 7 μas—this is equivalent to measuring the position to within the diameter of a hair from 1000 km away—between 12 and 25 μas down to V = 15, and between 100 and 300 μas to V = 20, depending on the colour of the star. The distance to about 20 million stars will thus be measured with a precision of 1% or better, and about 200 million distances will be measured to better than 10%. Distances accurate to 10% will be achieved as far away as the Galactic Centre, 30,000 light-years away. Measure the tangential speed of 40 million stars to a precision of better than 0.5 km/s. Derive the atmospheric parameters (effective temperature, line-of-sight interstellar extinction, surface gravity, metallicity) for all stars observed, plus some more detailed chemical abundances for targets brighter than V = 15. Measure the orbits and inclinations of a thousand extrasolar planets accurately, determining their true mass using astrometric planet detection methods. More precisely measure the bending of starlight by the Sun's gravitational field, predicted by Albert Einstein’s General Theory of Relativity and first detected by Arthur Eddington during a 1919 solar eclipse, and therefore directly observe the structure of spacetime. Potential to discover Apohele asteroids with orbits that lie between Earth and the Sun, a region that is difficult for Earth-based telescopes to monitor since this region is only visible in the sky during or near the daytime. Detect up to 500,000 quasars. Gaia was launched by Arianespace, using a Soyuz ST-B rocket with a Fregat-MT upper stage, from the Ensemble de Lancement Soyouz at Kourou in French Guiana on 19 December 2013 at 09:12 UTC (06:12 local time). The satellite separated from the rocket's upper stage 43 minutes after launch at 09:54 UTC. The craft headed towards the Sun–Earth Lagrange point L2 located approximately 1.5 million kilometres from Earth, arriving there 8 January 2014. The L2 point provides the spacecraft with a very stable gravitational and thermal environment. There it uses a Lissajous orbit that avoids blockage of the Sun by the Earth, which would limit the amount of solar energy the satellite could produce through its solar panels, as well as disturb the spacecraft's thermal equilibrium. After launch, a 10-metre-diameter sunshade was deployed. The sunshade always faces the Sun, thus keeping all telescope components cool and powering Gaia using solar panels on its surface. The astrometry instrument (Astro) precisely determines the positions of stars of magnitude 5.7 to 20 by measuring their angular position. By combining the measurements of any given star over the five-year mission, it will be possible to determine its parallax, and therefore its distance, and its proper motion —the velocity of the star projected on the plane of the sky. The photometric instrument (BP/RP) allows the acquisition of luminosity measurements of stars over the 320–1000 nm spectral band, over the same magnitude 5.7–20. The blue and red photometers (BP/RP) are used to determine stellar properties such as temperature, mass, age and elemental composition. Multi-colour photometry is provided by two low-resolution fused-silica prisms dispersing all the light entering the field of view in the along-scan direction prior to detection. The Blue Photometer (BP) operates in the wavelength range 330–680 nm; the Red Photometer (RP) covers the wavelength range 640–1050 nm. The Radial-Velocity Spectrometer (RVS) is used to determine the velocity of celestial objects along the line of sight by acquiring high-resolution spectra in the spectral band 847–874 nm (field lines of calcium ion) for objects up to magnitude 17. Radial velocities are measured with a precision between 1 km/s (V=11.5) and 30 km/s (V=17.5). The measurements of radial velocities are important to correct for perspective acceleration which is induced by the motion along the line of sight." The RVS reveals the velocity of the star along the line of sight of Gaia by measuring the Doppler shift of absorption lines in a high-resolution spectrum. In order to maintain the fine pointing to focus on stars many light years away, there are almost no moving parts. The spacecraft subsystems are mounted on a rigid silicon carbide frame, which provides a stable structure that will not expand or contract due to heat. Attitude control is provided by small cold gas thrusters that can output 1.5 micrograms of nitrogen per second. The telemetric link with the satellite is about 3 Mbit/s on average, while the total content of the focal plane represents several Gbit/s. Therefore, only a few dozen pixels around each object can be downlinked. The design of the Gaia focal plane and instruments. Due to the spacecraft's rotation, images cross the focal plane array right-to-left at 60 arc seconds per second. Focal plane, containing the detector for the Astrometric instrument in light blue, Blue Photometer in dark blue, Red Photometer in red, and Radial Velocity Spectrometer in pink. Similar to its predecessor Hipparcos, but with a precision one hundred times better, Gaia consists of two telescopes providing two observing directions with a fixed, wide angle of 106.5° between them. The spacecraft rotates continuously around an axis perpendicular to the two telescopes' lines of sight. The spin axis in turn has a slight precession across the sky, while maintaining the same angle to the Sun. By precisely measuring the relative positions of objects from both observing directions, a rigid system of reference is obtained. 1.0 × 0.5 m focal plane array on which light from both telescopes is projected. This in turn consists of 106 CCDs of 4500 × 1966 pixels each, for a total of 937.8 megapixels (commonly depicted as a gigapixel-class imaging device). Each celestial object will be observed on average about 70 times during the mission, which is expected to last five years. These measurements will help determine the astrometric parameters of stars: two corresponding to the angular position of a given star on the sky, two for the derivatives of the star's position over time (motion) and lastly, the star's parallax from which distance can be calculated. The radial velocity of the brighter stars is measured by an integrated spectrometer observing the Doppler effect. Because of the physical constraints imposed by the Soyuz spacecraft, Gaia's focal arrays could not be equipped with optimal radiation shielding, and ESA expects their performance to suffer somewhat toward the end of the five-year mission. Ground tests of the CCDs while they were subjected to radiation provided reassurance that the primary mission's objectives can be met. The expected accuracies of the final catalogue data have been calculated following in-orbit testing, taking into account the issues of stray light, degradation of the optics, and the basic angle instability. The best accuracies for parallax, position, and proper motion are obtained for the brighter observed stars, apparent magnitudes 3–12. The standard deviation for these stars is expected to be 6.7 micro-arc seconds or better. For fainter stars, error levels increase, reaching 26.6 micro-arc seconds error in the parallax for 15th magnitude stars, and several hundred micro-arc seconds for 20th magnitude stars. For comparison, the best parallax error levels from the new Hipparcos reduction are no better than 100 micro-arc seconds, with typical levels several times larger. The overall data volume that will be retrieved from the spacecraft during the nominal five-year mission at a compressed data rate of 1 Mbit/s is approximately 60 TB, amounting to about 200 TB of usable uncompressed data on the ground, stored in an InterSystems Caché database. The responsibility of the data processing, partly funded by ESA, is entrusted to a European consortium, the Data Processing and Analysis Consortium (DPAC), which was selected after its proposal to the ESA Announcement of Opportunity released in November 2006. DPAC's funding is provided by the participating countries and has been secured until the production of Gaia's final catalogue scheduled for 2020. Gaia sends back data for about eight hours every day at about 5 Mbit/s. ESA's three 35-metre-diameter radio dishes of the ESTRACK network in Cebreros, Spain, Malargüe, Argentina and New Norcia, Australia, receive the data. In October 2013 ESA had to postpone Gaia's original launch date, due to a precautionary replacement of two of Gaia's transponders. These are used to generate timing signals for the downlink of science data. A problem with an identical transponder on a satellite already in orbit motivated their replacement and reverification once incorporated into Gaia. The rescheduled launch window was from 17 December 2013 to 5 January 2014, with Gaia slated for launch on 19 December. Gaia was successfully launched on 19 December 2013 at 09:12 UTC. About three weeks after launch, on 8 January 2014, it reached its designated orbit around the Sun-Earth L2 Lagrange point (SEL2), about 1.5 million kilometers from Earth. In 2015 the Pan-STARRS observatory discovered an object orbiting the Earth, which the Minor Planet Center catalogued as object 2015 HP116. It was soon found to be an accidental rediscovery of the Gaia spacecraft and the designation was promptly retracted. Shortly after launch, ESA revealed that Gaia was suffering from a stray light problem. The problem was initially thought to be due to ice deposits causing some of the light diffracted around the edges of the sunshield and entering the telescope apertures to be reflected towards the focal plane. The actual source of the stray light was later identified as the fibers of the sunshield, protruding beyond the edges of the shield. This results in a "degradation in science performance [which] will be relatively modest and mostly restricted to the faintest of Gaia's one billion stars." Mitigation schemes are being implemented[when?] to optimise the mission performance. The degradation is more severe for the RVS spectrograph than for the astrometry measurements. It only affects the fainter stars. Gaia map of the sky by star density. The testing and calibration phase, which started while Gaia was en route to SEL2 point, continued until the end of July 2014, three months behind schedule due to unforeseen issues with stray light entering the detector. After the six-month commissioning period, the satellite started its nominal five-year period of scientific operations on 25 July 2014 using a special scanning mode that intensively scanned the region near the ecliptic poles; on 21 August 2014 Gaia began using its normal scanning mode which provides more uniform coverage. Although it was originally planned to limit Gaia's observations to stars fainter than magnitude 5.7, tests carried out during the commissioning phase indicated that Gaia could autonomously identify stars as bright as magnitude 3. When Gaia entered regular scientific operations in July 2014, it was configured to routinely process stars in the magnitude range 3 – 20. Beyond that limit, special procedures are used to download raw scanning data for the remaining 230 stars brighter than magnitude 3; methods to reduce and analyse these data are being developed; and it is expected that there will be "complete sky coverage at the bright end" with standard errors of "a few dozen µas". In 2018 the Gaia mission was extended to 2020, with an additional "indicative extension" extending for another two years until 2022. The limiting factor to further mission extensions is the supply of fuel for the micro-propulsion system, which is expected to last until November 2024. On 12 September 2014, Gaia discovered its first supernova in another galaxy. On 3 July 2015, a map of the Milky Way by star density was released, based on data from the spacecraft. As of August 2016, "more than 50 billion focal plane transits, 110 billion photometric observations and 9.4 billion spectroscopic observations have been successfully processed." The Gaia catalogue is released in stages that will contain increasing amounts of information; the early releases also miss some stars, especially fainter stars located in dense star fields and members of close binary pairs. The first data release, Gaia DR1, based on 14 months of observations made through September 2015, took place on 14 September 2016 and is described in a series of articles published in Astronomy and Astrophysics. The data release includes "positions and … magnitudes for 1.1 billion stars using only Gaia data; positions, parallaxes and proper motions for more than 2 million stars" based on a combination of Gaia and Tycho-2 data for those objects in both catalogues; "light curves and characteristics for about 3000 variable stars; and positions and magnitudes for more than 2000 … extragalactic sources used to define the celestial reference frame". Data from this DR1 release can be accessed at the Gaia archive, as well as through astronomical data centers such as CDS. Stars and Other Objects in the Second Data Release. The second data release (DR2), which occurred on 25 April 2018, is based on 22 months of observations made between 25 July 2014 and 23 May 2016. It includes positions, parallaxes and proper motions for about 1.3 billion stars and positions of an additional 300 million stars, red and blue photometric data for about 1.1 billion stars and single colour photometry for an additional 400 million stars, and median radial velocities for about 7 million stars between magnitude 4 and 13. It also contains data for over 14,000 selected Solar System objects. The coordinates in DR2 use the Gaia celestial reference frame (Gaia–CRF2), which is based on observations of 492,006 sources believed to be quasars, and which has been tied to the International Celestial Reference System. Comparison of Gaia–CRF2 with a preliminary version of the forthcoming ICRF3 shows a global agreement of 20 to 30 μas, although individual sources may differ by several mas. Since the data processing procedure links individual Gaia observations with particular sources on the sky, in some cases the association of observations with sources will be different in the second data release. Consequently, DR2 uses different source identification numbers than DR1. A number of issues have been identified with the DR2 data, including small systematic errors in astrometry and significant contamination of radial velocity values in crowded star fields, which may affect some one percent of the radial velocity values. Ongoing work should resolve these issues in future releases. Due to uncertainties in the data pipeline, the third data release, which will be based on 34 months of observations, has been split into two parts so that data that is ready first, will be released first. The first part, EDR3, consisting of improved positions, parallaxes and proper motions, will be released in the third quarter of 2020; DR3, scheduled for the second half of 2021, will include the EDR3 data, plus Solar System data, variability information, results for non-single stars, and astrophysical parameters. Most measurements in DR3 are expected to be 1.2 times more precise than DR2; proper motions will be 1.9 times more precise. The full data release for the five-year nominal mission, DR4, will include full astrometric, photometric, and radial-velocity catalogues, variable-star and non-single-star solutions, source classifications plus multiple astrophysical parameters for stars, unresolved binaries, galaxies, and quasars, an exo-planet list and epoch and transit data for all sources. Additional release(s) will take place depending on mission extensions. Most measurements in DR4 are expected to be 1.7 times more precise than DR2; proper motions will be 4.5 times more precise. Assuming an additional five-year extension until 2024, most measurements incorporating the full ten years of data will be 1.4 times more precise than DR4, while proper motions will be 2.8 times more precise than DR4. An outreach application, Gaia Sky, has been developed to explore the galaxy in three dimensions using Gaia data. In November 2017, scientists led by Davide Massari of the Kapteyn Astronomical Institute, University of Groningen, Netherlands released a paper describing the characterization of proper motion (3D) within the Sculptor dwarf galaxy, and of that galaxy's trajectory through space and with respect to the Milky Way, using data from Gaia and the Hubble Space Telescope. Massari said, “With the precision achieved we can measure the yearly motion of a star on the sky which corresponds to less than the size of a pinhead on the Moon as seen from Earth.” The data showed that Sculptor orbits the Milky Way in a highly elliptical orbit; it is currently near its closest approach at a distance of about 83.4 kiloparsecs (272,000 ly), but the orbit can take it out to around 222 kiloparsecs (720,000 ly) distant. In October 2018, Leiden University astronomers were able to determine the orbits of 20 hypervelocity stars from the DR2 dataset. Expecting to find a single star exiting the Milky Way, they instead found seven. More surprisingly, the team found that 13 hypervelocity stars were instead approaching the Milky Way, possibly originating from as-of-yet unknown extragalactic sources. Alternatively, they could be halo stars to this galaxy, and further spectroscopic studies will help determine which scenario is more likely. Independent measurements have demonstrated that the greatest Gaia radial velocity among the hypervelocity stars is contaminated by light from nearby bright stars in a crowded field and cast doubt on the high Gaia radial velocities of other hypervelocity stars. In November 2018, the galaxy Antlia 2 was discovered. It is similar in size to the Large Magellanic Cloud, despite being 10,000 times fainter. Antlia 2 has the lowest surface brightness of any galaxy discovered. GaiaNIR (Gaia Near Infra-Red) is a proposed successor of Gaia in the Near Infra-Red. The mission could enlarge the current catalog with sources that are only visible in the Near Infra-Red and at the same time improving the star parallax and proper motion accuracy by revisiting the sources of the Gaia catalog. ^ a b "Gaia: fact sheet". ESA. 24 June 2013. ^ a b "GAIA (Global Astrometric Interferometer for Astrophysics) Mission". ESA eoPortal. Retrieved 28 March 2014. ^ "Frequently Asked Questions about Gaia". ESA. 14 November 2013. ^ "Gaia Liftoff". ESA. 19 December 2013. ^ a b c "Gaia enters its operational orbit". ESA. 8 January 2014. ^ "ESA Gaia home". ESA. Retrieved 23 October 2013. ^ Spie (2014). "Timo Prusti plenary: Gaia: Scientific In-orbit Performance". SPIE Newsroom. doi:10.1117/2.3201407.13. ^ a b Overbye, Dennis (1 May 2018). "Gaia's Map of 1.3 Billion Stars Makes for a Milky Way in a Bottle". The New York Times. Retrieved 1 May 2018. ^ a b "ESA Gaia spacecraft summary". ESA. 20 May 2011. ^ "A billion pixels for a billion stars". BBC Science and Environment. BBC. 10 October 2011. ^ "We have already installed the eye of 'Gaia' with a billion pixels to study the Milky Way". Science Knowledge. 14 July 2011. Archived from the original on 6 April 2016. ^ "Gaia Science Performance". Rssd.esa.int. ^ "Gaia Science Objectives". European Space Agency. 14 June 2013. ^ "Gaia's mission: solving the celestial puzzle". University of Cambridge. 21 October 2013. ^ "ESA's Gaia... Launches With A Billion Pixel Camera". Satnews.com. 19 December 2013. ^ "Gaia space telescope to detect killer asteroids". thehindubusinessline.com. 19 December 2013. Archived from the original on 3 June 2014. ^ "Announcement of Opportunity for the Gaia Data Processing Archive Access Co-Ordination Unit". ESA. 19 November 2012. ^ "Arianespace to launch Gaia; ESA mission will observe a billion stars in our galaxy". Press releases. Arianespace. 16 December 2009. Archived from the original on 18 September 2010. ^ a b c d "ESA Gaia overview". ESA. ^ "Gaia spacecraft set for launch on mission to map a billion stars". Theguardian. 13 December 2013. ^ Perryman, M.A.C; Pace, O. (August 2000). "GAIA – Unraveling the Origin and Evolution of Our Galaxy" (PDF). ESA Bulletin. 103. ^ Bailer-Jones, C. A. L.; et al. (2013). "The Gaia astrophysical parameters inference system (Apsis)". Astronomy & Astrophysics. 559: A74. arXiv:1309.2157. Bibcode:2013A&A...559A..74B. doi:10.1051/0004-6361/201322344. ^ Kordopatis, G.; Recio-Blanco, A.; De Laverny, P.; Bijaoui, A.; Hill, V.; Gilmore, G.; Wyse, R. F. G.; Ordenovic, C. (2011). "Automatic stellar spectra parameterisation in the IR Ca ii triplet region". Astronomy & Astrophysics. 535: A106. arXiv:1109.6237. Bibcode:2011A&A...535A.106K. doi:10.1051/0004-6361/201117372. ^ Casertano, S.; Lattanzi, M. G.; Sozzetti, A.; Spagna, A.; Jancart, S.; Morbidelli, R.; Pannunzio, R.; Pourbaix, D.; Queloz, D. (2008). "Double-blind test program for astrometric planet detection with Gaia". Astronomy and Astrophysics. 482 (2): 699–729. arXiv:0802.0515. Bibcode:2008A&A...482..699C. doi:10.1051/0004-6361:20078997. ^ "GAIA – Exoplanets". European Space Agency. 27 June 2013. Archived from the original on 29 September 2013. ^ "Mapping the galaxy, and watching our backyard". ESA. July 2004. ^ Clark, Stephen (19 December 2013). "Mission Status Center". Soyuz Launch Report. Spaceflight Now. ^ Amos, Jonathan (19 December 2013). "BBC News – Gaia 'billion star surveyor' lifts off". ^ Gaia project team (24 April 2014). "Commissioning update". esa. ^ Liu, C.; Bailer-Jones, C. A. L.; Sordo, R.; Vallenari, A.; Borrachero, R.; Luri, X.; Sartoretti, P. (2012). "The expected performance of stellar parametrization from Gaia spectrophotometry". Monthly Notices of the Royal Astronomical Society. 426 (3): 2463–2482. arXiv:1207.6005. Bibcode:2012MNRAS.426.2463L. doi:10.1111/j.1365-2966.2012.21797.x. ^ a b Jordan, S. (2008). "The Gaia Project – technique, performance and status". Astronomische Nachrichten. 329 (9–10): 875–880. arXiv:0811.2345v1. Bibcode:2008AN....329..875J. doi:10.1002/asna.200811065. ^ a b "Gaia Focal Plane". ESA Science and Technology. ^ "Astrometry in Space". ESA Science and Technology. ESA. ^ "Europe Launching Gigapixel Probe To Map Milky Way". Techcrunch science update. Techcrunch. 6 July 2011. ^ "Gaia: Planets and Parallax". lostintransits. lostintransits. 19 December 2013. ^ "ESA's Gigapixel Camera Now In Space, Will Map the Milky Way in Unprecedented Detail". petapixel reviews. Petapixel. 19 December 2013. ^ De Bruijne, J. H. J.; Rygl, K. L. J.; Antoja, T. (2015). "Gaia astrometric science performance - post-launch predictions". EAS Publications Series. 1502: 791. arXiv:1502.00791. Bibcode:2014EAS....67...23D. doi:10.1051/eas/1567004. ^ Van Leeuwen, F. (2007). "Validation of the new Hipparcos reduction". Astronomy and Astrophysics. 474 (2): 653–664. arXiv:0708.1752. Bibcode:2007A&A...474..653V. doi:10.1051/0004-6361:20078357. ^ "VST Snaps Gaia en Route to a Billion Stars". ESO. Retrieved 12 March 2014. ^ "Making sense of it all – the role of the Gaia Data Processing and Analysis Consortium". Retrieved 8 April 2017. ^ "Gaia launch postponement update". ESA. 23 October 2013. ^ "Soyuz ST-B successfully launches Gaia space observatory". nasaspaceflight.com. 19 December 2013. ^ "Gaia Mission & Orbit Design Gaia Mission Section". Spaceflight101. Retrieved 19 December 2013. ^ "GAIA - Commissioning Update". European Space Agency. 24 April 2014. Retrieved 3 June 2014. ^ "STATUS OF THE GAIA STRAYLIGHT ANALYSIS AND MITIGATION ACTIONS". 17 December 2014. Retrieved 1 January 2015. ^ "Gaia takes science measurements". ESA. Retrieved 28 July 2014. ^ "Counting stars with Gaia". sci.esa.int/gaia. European Space Agency. Retrieved 16 July 2015. ^ "Gaia's second anniversary marked by successes and challenges". Retrieved 17 August 2016. ^ a b c "Data Release scenario". Retrieved 29 January 2019. ^ "Gaia Data Release 1 (Gaia DR1)". 14 September 2016. Retrieved 16 September 2016. ^ "Data Release 1". 15 September 2016. Retrieved 15 September 2016. ^ "Gaia Data Release 2 (Gaia DR2)". 25 April 2018. Retrieved 26 April 2018. ^ "Selected asteroids detected by Gaia between August 2014 and May 2016". Retrieved 2 December 2017. ^ a b c Brown, Anthony G.A. (12 April 2019). The Future of the Gaia Universe (PDF). 53rd ESLAB symposium "the Gaia universe". doi:10.5281/zenodo.2637971. ^ "Gaia spots stars flying between galaxies". 2 October 2018. Retrieved 3 October 2018. ^ "ESA's Gaia Spacecraft Spots Ghost Galaxy Lurking In Milky Way's Outskirts". Forbes. Retrieved 20 November 2018. ^ "CDF Study Report: GaiaNIR – Study to Enlarge the Achievements of Gaia with NIR Survey". sci.esa.int. Retrieved 5 March 2019. Wikimedia Commons has media related to Gaia (spacecraft). "Gaia blog". blogs.esa.int. European Space Agency. Journey to a Billion Suns is a 360° immersive film – Gaia mission. Launches are separated by dashes ( – ), payloads by dots ( · ). Manned flights are bolded. Launch failures are in italics. Payloads deployed from other spacecraft are (enclosed in brackets). This page was last edited on 21 April 2019, at 00:45 (UTC).